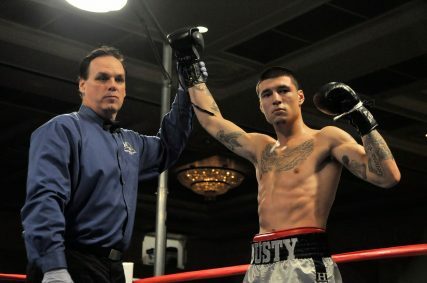 Dusty Hernandez-Harrison, only 19 years old and just 20 days after winning the WBC Youth Welterweight World Championship, scored a devastating first round knockout over Marlon Lewis at Dover Downs Hotel and Casino on Friday night. The win was Hernandez-Harrison’s eighth of 2013 and increased the undefeated 2013 GFL.TV Fighter Of The Year and Knockout of the Year nominee’s record to an outstanding 19-0, with 11 wins coming by knockout. Hernandez-Harrison used body shots sending Lewis (6-3-2, 3KOs), who had never been down in his career, to the canvas three times before the referee stopped the contest. More than 300 fans from the Washington, D.C., area made the 90 mile trip to Dover Downs Hotel and Casino to see the 2012 StiffJab.com Prospect of the Year win for the third time at the venue this year. After the fight Hernandez-Harrison spent the next 60 minutes signing autographs and posing for photos with fans, which has been customary throughout his young career. 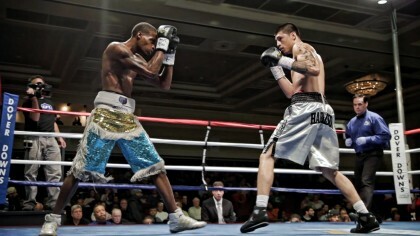 “I appreciate the fans as much as they show their appreciation for me when I am in the ring,” Hernandez-Harrison said. “The focus that Dusty shows in the ring is the same kind of focus that champions need regardless of the sport,” said Phil Ivey, co-founder of Hernandez Harrison’s promoter All-In Entertainment and widely known as the Best Poker Player in the World. “To be great at anything you not only need the talent, but you must have the work ethic and drive to be the best. Dusty has shown he wants to be great,” added Ivey, a Nine-Time World Series of Poker Bracelet Winner. In the dressing room before the fight, the Hernandez-Harrison close knit team was joined by William Wesley, whom Hernandez-Harrison affectionately refers to as “Uncle Wes” and who serves as a mentor to the young Champion. “World Wide Wes” is a close friend of his promoter, Jeff Fried. Another Fried business partner, recording artist Ginuwine, visited with the undefeated fighter after the bout to extend his congratulations and graciously offered to perform the National Anthem at the young fighter’s next boxing event. At the age of 19, Hernandez-Harrison is being groomed to be one of the superstars of the boxing industry. The WBC Youth Welterweight World Champion possesses the unique characteristics of a marquee athlete, both in the manner in which he displays his craft inside the ring and engages with fans and others outside the ring. “Our singular focus for 2014 was Dusty’s continued development as a professional athlete. We wanted to expose him to diverse situations and individuals preparing him not only for 2014 in the ring, but for many years to come as a talented, intelligent and passionate young professional,” Fried said. “For Dusty to be learning from extraordinary talents like Andre Ward is invaluable for his growth, and his willingness to continue to learn from the best is one of Dusty’s endearing qualities that make his so special,” added Fried. 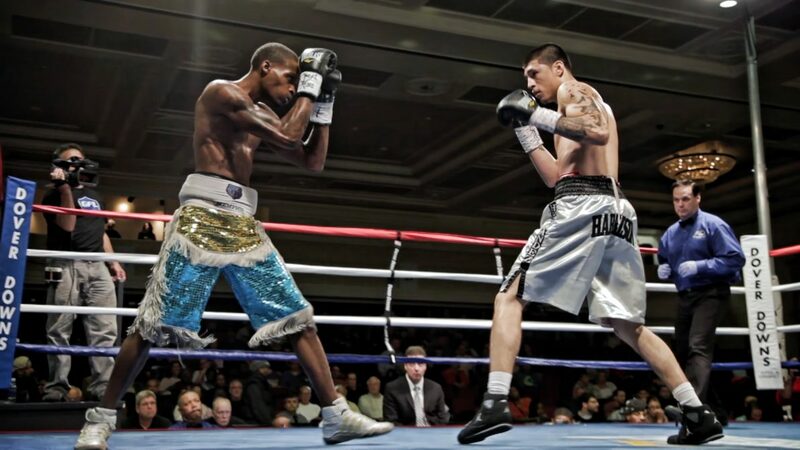 Discussions are already underway for Hernandez-Harrison to return to the ring in early 2014 in the Washington, D.C. area, and then to continue his aggressive schedule thereafter, including bouts throughout the United States and abroad. Hernandez-Harrison is continuing his education while also taking Spanish lessons as his popularity transcends diverse demographics, and introducing many people to boxing for the first time. “I want to learn, both in the ring from the great ones like Andre, and outside the ring from business people and the different entrepreneurial dealings that Jeff includes me in,” Hernandez-Harrison said. 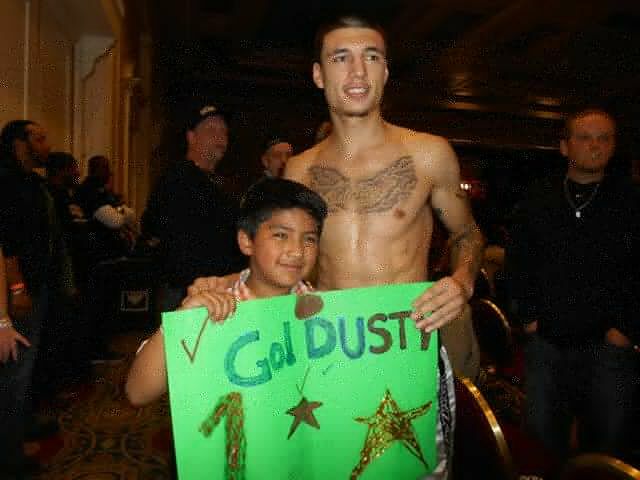 For Dusty Hernandez-Harrison, 2014 should be an exciting year as he continues to establish himself as one of the true rising and charismatic stars in the boxing industry.